Harry Potter had been to South Korea. Really ? The above photo is an evidence. Harry Potter was posing in front of a building in Everland Theme Park. Actually, I am just kidding. That was a Harry Potter movie poster that placed outside a cinema. 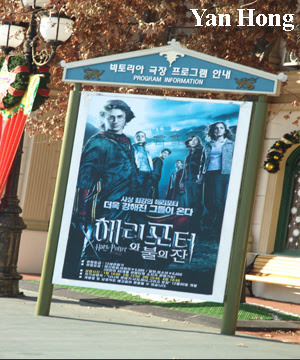 The letters of the poster were in Korean except the second line. Honestly, I can't read any Korean word. I only speak a few simple words of Korean. According to my son, the first line at the top is "Victoria Cinema Program Information". The largest words mean "Harry Potter". Please inform me if I had wrongly interpreted. I have no idea this poster is about which series of Harry Potter stories because I am not Harry Potter's fan.